February is Heart Month so it is a great time to make sure you are practicing a heart healthy lifestyle. Heart disease is the number one killer of women so it just makes sense to incorporate a few a healthy choices and exercise for heart health. This post is sponsored by Campbell Soup Company. All opinions expressed are my own. So you have decided to exercise for heart health but now you are wondering what you should do? Here are some tips for heart healthy exercise. The American Heart Association suggests that to improve overall cardiovascular health, you should get at least 150 minutes per week of moderate exercise or 75 minutes per week of vigorous exercise (or a combination of moderate and vigorous activity). This breaks down to about 30 minutes a day, 5 times a week for moderate exercise or 25 minutes of vigorous aerobic activity, 3 times a week. The AHA also says that if you are looking to lowering your blood pressure or cholesterol, you may want to increase the exercise to 40 minutes of aerobic exercise of moderate to vigorous intensity, three to four times a week. Here is the beautiful part. You get to pick any type of physical activity that you enjoy. (Pick what you enjoy so that you have the most chance of carrying through with your choice.) It can be as simple as walking for 30 minutes, which is free and easy! Exercise for heart health can include things like climbing stairs, playing sports, doing yoga, aqua aerobics, or biking. Aerobic exercise benefits your heart, and includes walking, biking, and swimmng. Strength and stretching exercise benefits your overall stamina and flexibility. It is a great idea to include both types of exercise into your routine. I say routine because having a routine is an important part of adopting the habit of exercising. A new habit is hard to create at first but then is self sustaining. A warm-up helps to dilates your blood vessels and raise your muscle temperature for optimal flexibility and efficiency. A warm up helps slowly raise your heart rate which minimizes stress on your heart. The cool-down is just as crucial to your health. The cool down prevents the light-headedness that can happen when you stop too suddenly. It is important to drop your heart rate and blood pressure slowly. I hope these exercise for heart tips help you adopt a new fitness routine that works for you and your heart. It is also important to make healthy nutritional choices for good heart health. Campbell Soup Company is dedicated to helping women care for their hearts by providing delicious, heart-healthy foods and recipes as part of their continued support of the American Heart Association. Campbell Soup Company makes it easy to make heart healthy choices! They balance great taste with nutritional value and offer more than 80 options that meet the criteria for the American Heart Association’s heart check mark. Certified Campbell’s products include Healthy Request® soups, V8 beverages, Prego pasta sauces and Pepperidge Farm whole-grain breads. 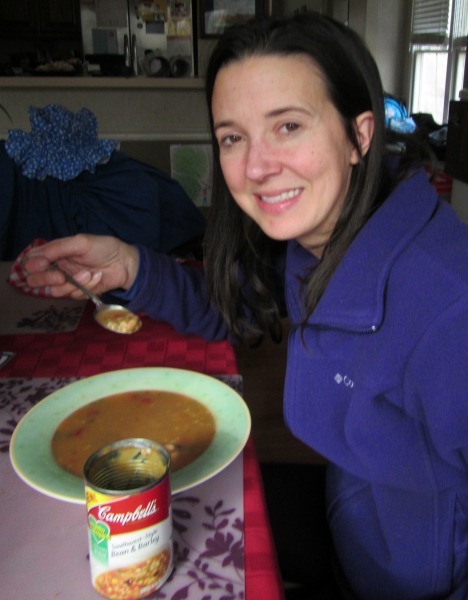 My favorite Campbell’s Healthy Request® Condensed Soup is the Southwest Style Bean and Barley. You can find recipes here campbellskitchen.com. Campbell Soup Company is launching the Address Your Heart with Campbell’s Pinterest Sweepstakes to encourage small steps towards making heart-healthy lifestyle choices every day! You have the chance to win a variety of daily prizes throughout American Heart Month (February) from heart-healthy products to bakeware and kitchen utensils. Campbell is giving away daily prizes totaling more than $100 each and the grand prize is a trip for two to the luxurious Miraval Resort and Spa in Tucson, AZ! Enter for a chance to win by visiting addressyourheart.com. Just fill out the short entry form and click “submit”. You can then also click “follow” @CampbellsKitchen on Pinterest and pin your favorite recipes with inspiration from the Campbell’s Address Your Heart Every Day Pinterest board for extra entries. When you break down the exercise amounts, it don’t seem like it’s that daunting. Now — I am ready to go tackle some exercise.